A ‘Right of Burial’ is an exclusive right granted to the nominated person for a specific burial site (plot). 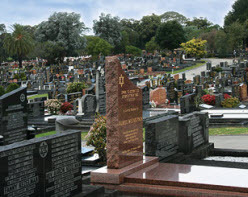 Upon receipt of payment in full for the burial site, Rookwood Jewish Cemetery will issue a ‘Right of Burial’ certificate in favour of the nominee. Detailed below are two options to consider when reserving a plot. Each option has its own characteristics to suit different individuals, and are outlined as below. Plots are available in the monumental and the lawn sections. A monumental plot is a term used to describe a grave covered with granite, marble, concrete or some other material, and finish above ground level. 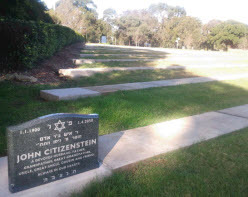 Monuments vary from simple to ornate, whilst abiding by the Australian standards and guidelines in concert with the Rookwood Jewish Cemetery rules and regulations. Monuments are organized though a monumental mason of your choice. To obtain a list of monumental masons please follow this link stonemasons. An alternative to a monumental plot is a lawn cemetery plot. These are, as the name suggests, graves covered by grass. Uniform in design, these imperial green headstones are organized directly through the lawn contracted monumental mason, Binstock and Sons Memorials Pty Ltd, or with our helpful office staff at Rookwood. At no additional charge, the grave site will be maintained by the Jewish Cemeteries employees. To find out more about our pricing strategy, or to talk with one of our Sales and Customer Service Representatives about our services, please contact us .